If you were asked to sum up your life in six words, could you do it? I was challenged with this recently and it’s been an interesting exercise. I wrote a bunch of bios, then a bunch more. It was surprising how many I could come up with, some poetic, some funny, and some that resembled silly haikus. All of them a bit out of the ordinary, yet candid and concise. Of course, I stumbled upon many more (like this) out there. The online magazine Smith asked its readers to do the same. 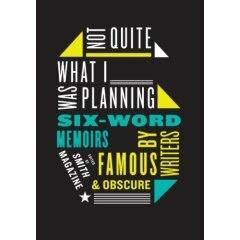 The result was Not Quite What I Was Planning, a collection of six-word memoirs by famous and not-so-famous writers, artists, and musicians. Deceptively simple. Surprisingly addictive. The profound brevity of these bios leaves you knowing so much, and yet somehow leaves you wanting more. Give it a try, the experience of capturing real-life stories in six words is an insightful one. What’s your six-word bio? We invite you to leave it in the comments section. Non-lasic reader, engineer writer, book lover. Nicely done, thanks for sharing with u! DANG it. Lori stole my words. Passionate mystic masked as government scientist. Oh these are really good! Particularly the bit about not acting your age, love it! Mother of twins, drinker of Twinings.